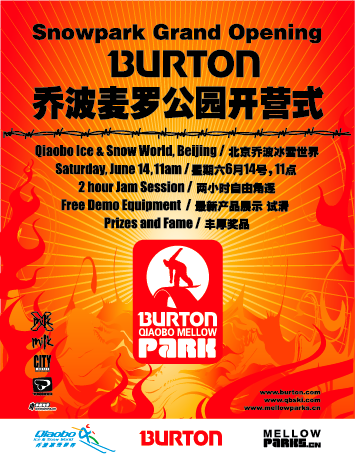 Beijing, CHINA (May 12, 2008) - In one of the most exciting strategic moves in the Chinese snowboard market to date, Burton has signed as the title sponsor of The Burton Qiaobo Mellow Park, a brand new indoor year-round terrain facility. With the country's top park firm, the snowboard industry's most recognizable name and a state-of-the-art indoor snow dome, the landscape of Chinese snowboarding will be forever changed this June 14th when Qiaobo Ice and Snow World unveil their brand new Burton Mellow Park. "The drive behind the project is to get more people on the snow riding and having fun," comments Steve Zdarsky, Mellow CEO . "With Burton as our partner and their LTR program in effect, the new park is really going to draw the crowds. Besides, we are all just super stoked we can now ride in Beijing year-round!" Indoor facilities are becoming more accessible in non-winter friendly environments around the world. The park, located just outside the city center, will boast a kicker line, wallride as well as rail and box combinations. "The park will be as sick as we can make it" explains Marco Huang, Park Designer. "The snow in Qiaobo is surprisingly good, and the management is stoked to have a new Mellow Park, so it's going to be a fun area for all levels of riding". Mellow is the owner of many events including the TTR 4 Star Red Bull Nanshan Open as well as many international standard parks around the country. With nearly every single advancement in Chinese snowboarding on its long list of accomplishments, Mellow Constructions is the only partner of choice for snowboard marketing and events in China.